Rectangular Glass Vessel Sink in Amber Sunset with Linus Faucet in Antique Rubbed Bronze is rated 4.8 out of 5 by 14. Rated 5 out of 5 by Ridepaddleguy from Gorgeous sink! 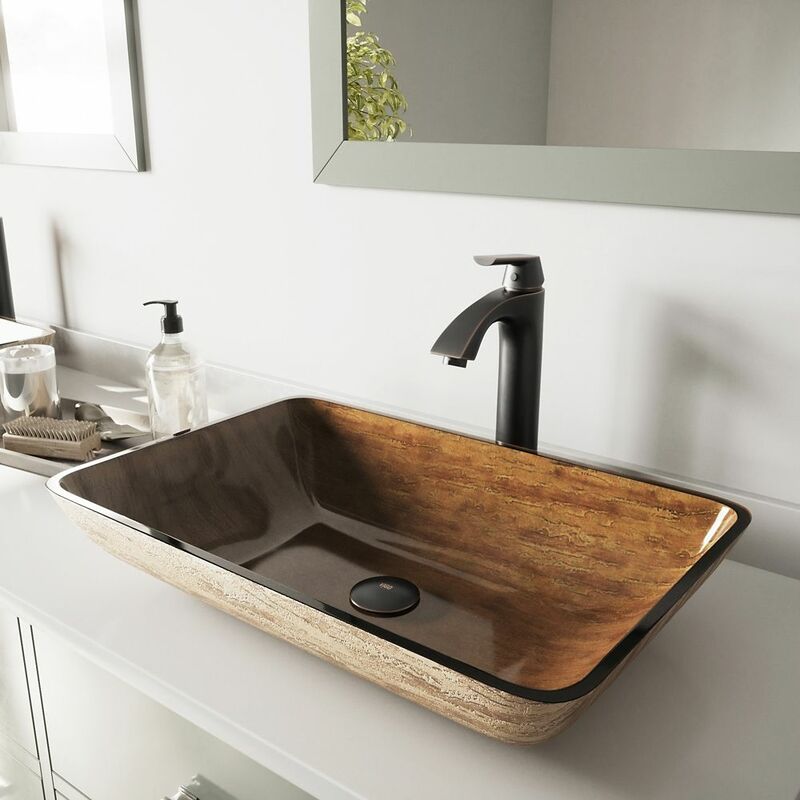 We purchases three Vigo vessel sinks, and they are all beautiful. Parts seem to be of high quality. Rated 5 out of 5 by breeze from The most outstanding feature was it eye appeal. There is not much not to like about it. We have h... The most outstanding feature was it eye appeal. There is not much not to like about it. We have had this sink about two weeks now, and it compliment the rest of the bathroom. I am very happy with the purchase. Rated 5 out of 5 by Kathy from A very nice, elegant Sink.... A very nice, elegant Sink. Rated 5 out of 5 by zachris from Really beautiful gold clear glass vessel sink. Really beautiful gold clear glass vessel sink. Rated 5 out of 5 by AuthorMatt from The color and style is so unique. It adds... The color and style is so unique. It adds the perfect touch to the new master bathroom. Rated 5 out of 5 by Koi from Happy to receive it, my daughter's bathroom replacement. She enjoys it, again Mahalo Means thank ... Happy to receive it, my daughter's bathroom replacement. She enjoys it, again Mahalo Means thank you. Rated 5 out of 5 by Cabinclassy from This sink is not only BEAUTIFUL but very functional because of its size. I love the length of it.... This sink is not only BEAUTIFUL but very functional because of its size. I love the length of it. You don't get splashing over the sides with it. :) It is AWESOME! !